One of Ghost’s Nameless Ghouls has hinted at the serious side of the band’s nature. They’re already known for attention to detail in their studio and stage work, while pushing their light-hearted take on religion via their costumes and performance. The Ghoul tells Rolling Stone: “We came up with this mixture where we could combine all our favourite adolescent music styles. “We found a way of having an extreme metal riff then throwing a pop melody over it. But he continues: “If, 100 years from now, there’s a greater acceptance that we can’t go and behead people because of what we think will happen in the afterlife? And we could have anything to do with getting people to accept the fact that we don’t really know anything? I would be really, really happy. 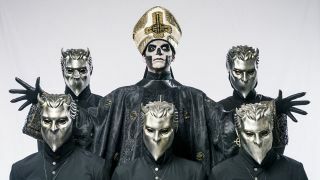 Ghost’s third album Meliora is released on August 21. They’re featured in the current edition of Classic Rock, on sale now in print, digital and via TeamRock+.